The genus of widow spiders, Latrodectus, has limited records of the pathogens, parasites and parasitoids known to affect them. In the United States, a known associated parasitoid is Philolema latrodecti (Fullaway). Little is documented regarding this species, but it is confirmed to target multiple widow spider species as hosts for reproduction (Boucek 1988, Fullaway 1953). 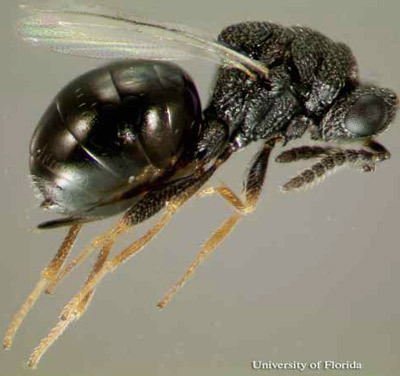 Another parasitoid of note is a scelionid wasp, Baeus latrodecti Dozier, which was recorded as emerging from the egg sacs of the Southern black widow, Latrodectus mactans Fabricius (Dozier 1931). Figure 1. Adult Philolema latrodecti (Fullaway), a parasitoid of the widow spiders in Latrodectus Walckenaer. Photograph by Christopher S. Bibbs, University of Florida. Philolema latrodecti was originally described as Eurytoma latrodecti (Fullaway 1953). It was later moved into the new genus Desantisca with other egg sac parasitoids that were originally described in the genus Eurytoma (Burks 1971). Research to phylogenetically reclassify the large family Eurytomidae using morphological differences placed it into the genus Philolema (Lotfalizadeh et al. 2007). Baeus latrodecti was described twice, once as Baeus latrodecti (Dozier 1931) and again as Baeus californicus (Pierce 1939, Krombein et al. 1979). Neither Philolema latrodecti nor Baeus latrodecti have an official common name sanctioned by the Entomological Society of America. Philolema latrodecti was originally described from several collections in Hawaii, and was found during collections of brown widow, Latrodectus geometricus (Koch), egg sacs from Honolulu and Oahu during 1945 and 1946 (Fullaway 1953). Cataloguing of spider parasitoids in Florida has revealed its presence in the continental United States (Brambila & Evans 2001). The species appears to occupy warmer climate zones (Boucek 1988, Herting 1971, Fullaway 1953), and the known widow hosts have a wider distribution, but any movement in the United States since discovery in Florida has not been recorded. 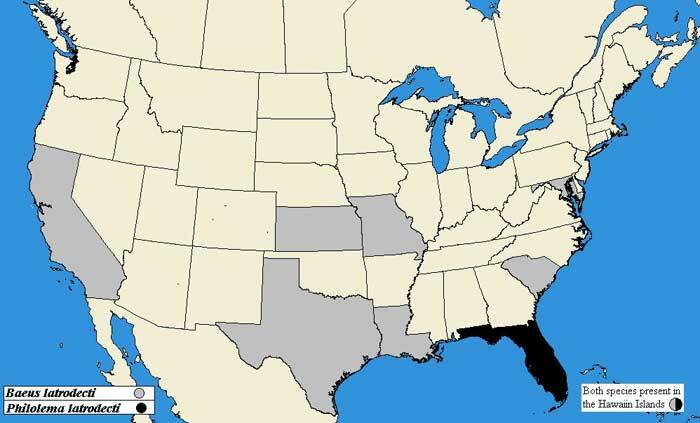 For the U.S., distribution information is incomplete and more verifible records are necessary to provide the range of Philolema latrodecti since introduction into the contiguous 48 states. Philolema latrodecti has also been observed outside of the United States, emerging from Latrodectus hasselti Thorell egg sacs in Queensland, Australia and the island chains near the Philippines (Boucek 1988, Herting 1971). For Baeus latrodecti, the 1979 Catalogue of Hymenoptera in America North of Mexico indicates occurrence in California, Hawaii, Kansas, Louisiana, Maryland, Missouri, South Carolina and Texas (Krombein et al. 1979). Immatures: Eggs and larvae of both species have no formal descriptions to date. Philolema latrodecti adults appear as small, black, ant-like or wasp-like organisms. The antennae are less than half of the body length, appearing short and thick. Figure 3. Adult Philolema latrodecti (Fullaway), a parasitoid of the widow spiders in Latrodectus Walckenaer, showing size relative to a U.S. dime. Photograph by Christopher S. Bibbs, University of Florida. 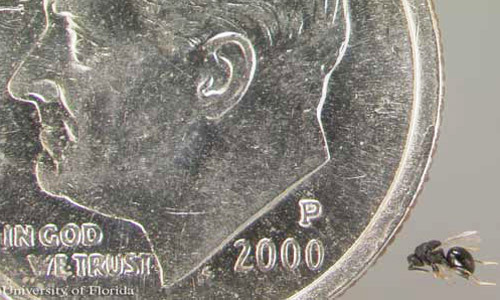 Under magnification, the abdomen is seen as approximately equal to or shorter than the thorax. The abdomen appears smooth and polished with a rounded surface. The head and thorax are black, but silvery hairs dull the luster. The head and thorax are rough in texture, which is in contrast to the smooth texture of the abdomen. The body is black, but the leg segments below the femur are significantly lighter in color. Figure 4. Adult female Philolema latrodecti (Fullaway), a parasitoid of the widow spiders in Latrodectus Walckenaer. Photograph by Christopher S. Bibbs, University of Florida. Males and females are difficult to distinguish. Females average 1.5–2.0 mm in length and have a slightly protruding ovipositor at the tip of the abdomen. Their antennae have a 3-segmented club. 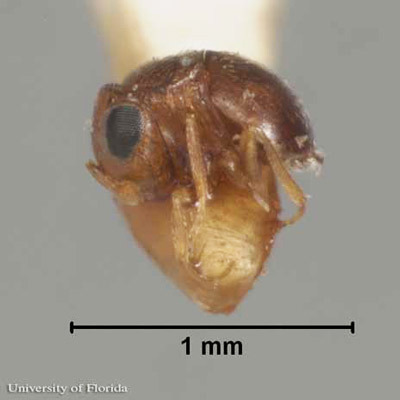 Males average 1.0–1.75 mm in length, with a 2-segmented antennal club. The petiole joining the abdomen to the thorax is longer in males. The terminal end of the male abdomen is telescoped, resulting in a short, somewhat tapered tip. Figure 5. 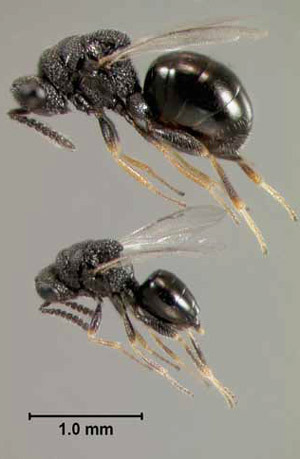 Comparison of adult Philolema latrodecti (Fullaway), a parasitoid of the widow spiders in Latrodectus Walckenaer. The female is at top, with a male below her. Photograph by Christopher S. Bibbs, University of Florida. Baeus latrodecti adults average less than 1.0 mm in body length. Antennae appear to have a two jointed club because of a constriction in the middle of the club. Males have wings, but females are wingless with stronger hind legs and stouter body; the eyes of both sexes are black. Body color ranges from a honey yellow to a dark orange. Figure 6. Adult male Baeus latrodecti Dozier, a parasitoid of the southern black widow, Latrodectus mactans Fabricius. Photograph by Lyle J. Buss, University of Florida. Figure 7. Adult female Baeus latrodecti Dozier, a parasitoid of the southern black widow, Latrodectus mactans Fabricius. Photograph by Lyle J. Buss, University of Florida. Observational data regarding either obligate egg parasitoid are limited. Laboratory observations in Honolulu and Oahu detailed the emergence of Philolema latrodecti from the egg sacs of the southern black widow, Latrodectus mactans, and the brown widow, Latrodectus geometricus Koch (Fullaway 1953). Philolema latrodecti has also been documented emerging from the egg sacs of Latrodectus geometricus in Florida (Brambila & Evans 2001). Outside of the United States, this parasitoid has been recorded emerging from the egg sacs of the redback spider, Latrodectus hasselti (Boucek 1988). Rearing by Lyle Buss from an Latrodectus geometricus egg sac collected in Gainesville, Florida in 2010, yielded 16 wasps for the single egg sac. Rearing by Christopher Bibbs from seven Latrodectus geometricus egg sacs collected in Gainesville, Florida in 2010, yielded 13–16 wasps per egg sac. 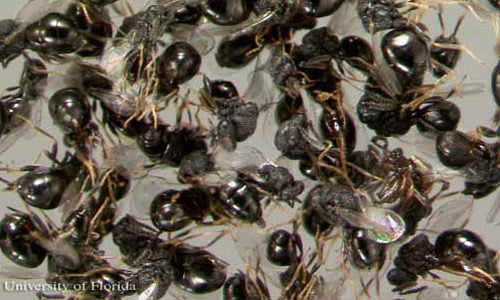 Four Latrodectus mactans egg sacs collected in Balm, Florida in 2011, yielded 15–17 wasps per egg sac. Figure 8. 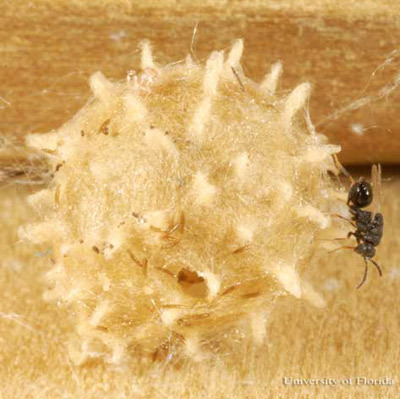 Philolema latrodecti (Fullaway), a parasitoid of the widow spiders in Latrodectus Walckenaer, perched on the egg sac of a brown widow spider, Latrodectus geometricus Koch. Photograph by Lyle J. Buss, University of Florida. Based on these records, Philolema latrodecti can use multiple members of the genus Latrodectus as a host. Other U.S. species of interest are the red widow, Latrodectus bishopi (Fabricius), the northern black widow, Latrodectus variolus Walkenaer, and the western black widow, Latrodectus hesperus Chamberlin & Ivie. Baeus latrodecti was recorded emerging from egg sacs of black widows in southern California and the island of Haiti, and was introduced into Hawaii (Bianchi 1945, Dozier 1931, Pierce 1939). After oviposition, emergences occur within seven days; the number of parasitoids per emergence was not indicated. Dozier (1931) and Pierce (1939) described the parasitoid as emerging from Latrodectus mactans. It has not been documented since the formal description separating Latrodectus hesperus from Latrodectus mactans (Chamberlin and Ivie 1935) as to whether or not Baeus latrodecti will emerge from egg sacs of Latrodectus hesperus. Bianchi FA. 1945. Notes on the abundance of the spiders Lactrodectus mactans, L. geometricus and Argiope avara, and of their parasites on the Island of Hawaii. Proceedings of the Hawaiian Entomological Society 12: 245-247. Boucek Z. 1988. Australasian Chalcidoidea (Hymenoptera): A Biosystematic Revision of Genera of Fourteen Families, with a Reclassification of species. CAB International, Wallingford, Oxon, U.K., Cambrian News Ltd; Aberystwyth, Wales. 108 pp. Burks BD. 1971. A synopsis of the genera of the family Eurytomidae (Hymenoptera: Chalcidoidea). Transactions of the American Entomological Society 97: 1-89. Chamberlin RV, Ivie W. 1935. The black widow spider and its varieties in the United States. Bulletin of the University of Utah 25: 1-29. Dozier HL. 1931. A new scelionid egg parasite of the black widow spider. Proceedings of the Entomological Society of Washington 33: 27-28. Fullaway DT. 1953. 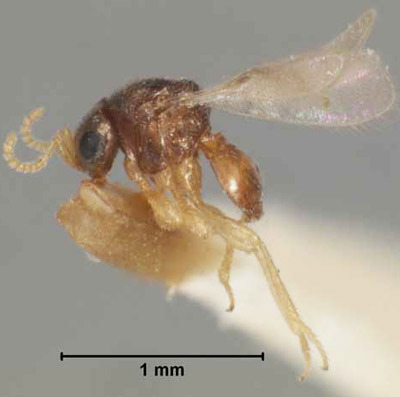 Three new species of Eurytoma (Hymenoptera: Eurytomidae). Proceedings of the Hawaiian Entomological Society 15: 33-36. Herting B. 1971. Arachnida to Heteroptera: A Catalogue of Parasites and Predators of Terrestrial Arthropods. Section A. Host or Prey/Enemy. Commonwealth Agricultural Bureaux, Slough, England. 1. 129 pp. Krombein KV, Hurd PD, Smith DR, Burks BD. 1979. Catalog of Hymenoptera in America North of Mexico. Vol. 1 Smithsonian Institution Press, Washington, D.C. 1160 pp. Lotfalizadeh H, Delvare G, Rasplus JY. 2007. Phylogenetic analysis of Eurytominae (Chalcidoidea: Eurytomidae) based on morphological characters. Zoological Journal of the Linnaean Society 151: 441-510. Pierce WD. 1939. The black widow spider and its parasites. Bulletin of the Southern California Academy of Sciences 37: 101-104.